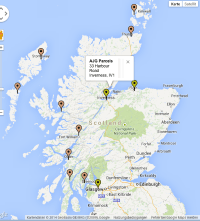 Founded in 1992, AJG Parcels Limited is based in Inverness. It serves the Scottish Highlands and Islands, as well as Argyll. The collection and delivery services company operates more than 90 vehicles throughout its network. According to the company, it handles over 9,000 parcel deliveries and more than 800 parcel collections each day. Starting with just two employees, the company now employs more than 120 people. Based in Scotland, AJG Parcels is a regional parcel carrier specialising in collections and deliveries within the Scottish Highlands and Islands. With a hub and spoke network, AJG Parcels offers same day and next day delivery for most of the parcels it handles. In business for over 20 years, the company also provides final mile delivery for a variety of parcel carrier partners. AJG Parcels has a live transfer Proof of Delivery information system. The system allows for signature captures to be presented and displayed to customers within minutes of a parcel collection or delivery. Drivers and couriers also use hand-held scanners, which allow for real-time updates on the progress of parcels as they are collected or delivered. A consignment number or order reference is required to track a parcel. To track a parcel, visit the dedicated service website for AJG Tracking. AJG Parcels’ operational hub and headquarters in Inverness is a purpose-built facility with approximately 10,000 square feet. The company also operates 12 depots throughout Scotland. With this network of depots, AJG Parcels is capable of offering same day delivery to many destinations throughout the Scottish Highlands. It also provides next day delivery to many outlying areas in the Highlands and Islands such as Orkney and the Western Isles. The company has made several investments in recent years to improve service quality. For example, AJG Parcels invested £1 million in new delivery vehicles that offer greater fuel efficiency. The company also recently replaced more than 80 per cent of its delivery vehicles for newer models with a reduced carbon foot print. Using a state-of-the-art GPS tracking system, AJG Parcels is also able to monitor its carbon footprint as well as increase route and driver efficiencies. AJG Parcels offers a range of collection and delivery services, including timed delivery and next day in Scotland. The company also delivers parcels to other parts of the mainland of the United Kingdom. In addition to offering its own parcel collection and delivery service, AJG Parcels provides final mile delivery for APC, City Link, DPD, UK Mail, UPS and XDP Express. AJG’s timed delivery services are available for all consignments sent to destinations within the UK mainland. In addition to a pre-booked 7:30 a.m. delivery to major towns and cities throughout the UK from Monday to Friday, the company also offers Saturday delivery before 12:00 p.m. Other timed delivery services are available Monday to Friday before 9.00 a.m., 10:00 a.m., 12:00 p.m. and 4:00 p.m.
Next day delivery to local destinations in Scotland is available when parcels are dropped off at the company’s Inverness hub by 7:00 p.m. Local next day delivery is available for addresses within the following postcodes: AB36, 37, 38, 55 and 56, FK16 to FK21, HS1 to HS 5, IV1 to IV55, KW1 to KW14, PA20 to PA40, and PH19 to PH41. 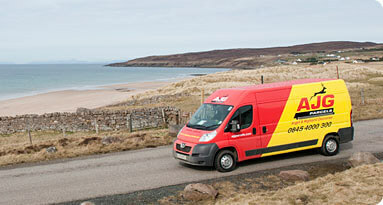 Two to three day delivery is also offered to the Scottish Islands. This service is available to destinations in the following postcodes: HS6 to HS8, KW15 to KW17, PA42 to PA44, and PH41 to PH78. All shipments are restricted to a maximum wright of 50 kilograms per item. AJG Parcels does not set an overall restriction per consignment, although a special pallet rate may be offered for larger consignments. AJG Parcels does not ship items that are over 3.05 metres, including packaging. The company does not transport any items that are not completely wrapped. The maximum parcel size is typically 125 centimetres by 75 centimetres by 60 centimetres. AJG Parcels does not transport dangerous goods or substances. For example, the company will not carry weapons and firearms, including replicas and paintball guns. The company will also not carry mattresses in plastic covers, bikes, car and vehicle parts, exposed metal, furniture, flowers, plants and trees. Certain items may be accepted if they are fully boxed or packaged appropriately. All items sent with AJG Parcels are covered by limited liability cover of £13 per kilogram, unless otherwise stated when the item is shipped. Items are also subject to a standard £50 excess on all claims. Certain goods are not covered, including money and money orders, bullion, cheques, stamps, securities and bonds, precious metals and stones, jewellery, watches, antiques, artwork, tobacco, wines and spirits, perishables and consumables, furs, pottery and ceramics, living creatures, and plasma screens. Goods with limited liability include mobile phones and computers. When an item cannot be collected during the first attempt, an AJG Parcels driver will leave a calling card. Customers are asked to call 0845 4000 300 to arrange another collection. An extra charge may be levied if items are not ready for collection. For deliveries, a driver will leave a calling card with the consignment reference number and the phone number of the local AJG Parcels depot. AJG Parcels does not leave parcels without a signature or a request to deliver the parcel to an alternative address without authorisation from the sender. The company keeps undelivered parcels for five days before returning them to the sender. Parcel senders may indicate that the item may be left with a neighbour or without a signature. In these cases, the calling card left by the driver will provide information on the location where the parcel was left. Recipients may also request a redelivery online. Items sent with AJG Parcels may be dropped off at a local depot. Depots are located throughout Scotland. To locate a local AJG Parcels depot, please feel free to visit the AJG Depot finder. The page is showing a map, where you can zoom in to your area, in order to find the next AJG drop-off shop. You will be able to get further information in the shops as well. AJG Parcels offers an online tool for account holders as well as non-account holders to book a parcel collection. With online booking, AJG customers simply enter details into a form and the system automatically arranges the shipment. An address label is produced, which can be printed using labels that are provided to account holders without charge. All online bookings are verified to ensure delivery addresses are correct. Proof of delivery is also emailed or customers can view a report or track shipments online. As of 2014, AJG Parcels employs 125 people. Operations and head office positions are available with the company, which offers competitive company benefits as well as learning and development opportunities. Anyone interested in working with AJG Parcels should email the company’s Human Resources Department at recruitment@ajgparcels.com. For current vacancies, visit the Human Resources website. The registered address for AJG Parcels Ltd. is 33 Habour Road, Inverness, IV1 1UA. To reach the company by phone, call 0845 4000 300. Alternatively, email AJG Parcels at info@ajgparcels.com. Hi how do I make a complaint about one of your drivers, in Keith today. Ware not in America, driving on the right hand side of a road when a pedestrian has the right of way :@ cutting me off. Hello. I was expecting a pick up this morning from address Denbrae House, 2 Mid Srtreet, Keith, Moray. Ab55 5ag. The courier from your company couldnt make the collection yesterday because they had the wrong address an error by a third party. Can this parcel be picked up somertime tomorrow, wednesday 8th March. Please can you either call this number 01542882493 I have given or email this francesssmith@hotmail.com to confirm the pick up. REFERENCE NUMBER mpd0100-4941-1 has it been collected. I returned 2 items from 2 separate orders to Zalando in Germany. The company offered free returns via Hermes but it was yourselves who collected both items on Monday 11th Jan. I wasn’t given a receipt or tracking number so I am unable to track the return. Can you please send me a tracking number as the items haven’t yet been received. The two parcels were collected from 62 Braeside park, Balloch, IV2 7HN and destination was Zalando SE, Regioparkring 25,41200 Monchengladbach, Germany.